Thank you, Leah! I do use an enameled Dutch oven. And I had just fed my starter. I have always tended to think longer rises = better bread. So I’ve let the initial rise get longer and longer. I’ll try shortening that up and see if it helps. Thank you for taking the time to respond! Much appreciated. Wow, I think you may have found your answer! Definitely shorten up your initial rise and I think you’ll have success! And keep an eye on your secondary rise in the basket. It takes time to learn to “read your dough” instead of totally “going by the clock.” PLEASE let us know how your next loaf comes out. I think it’ll be awesome! @Bdana, Definitely! My husband’s diet is medically restricted so I can’t use any whole grains for his breads. 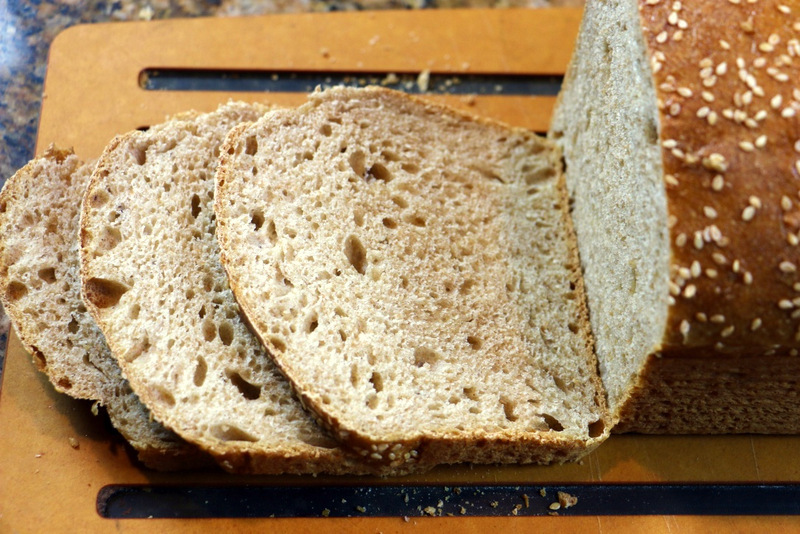 I exclusively use Breadtopia’s organic high protein bread flour to bake all his breads. It’s a white bread flour and is awesome with a great high rise! I decided to try the Breadtopia No- Knead recipe yesterday. Proofed overnight and baked this morning in my cast iron DO. Although I didn’t get quite the rise I was expecting it is still a lovely loaf. Great texture and sourdough flavor! Nice loaf! 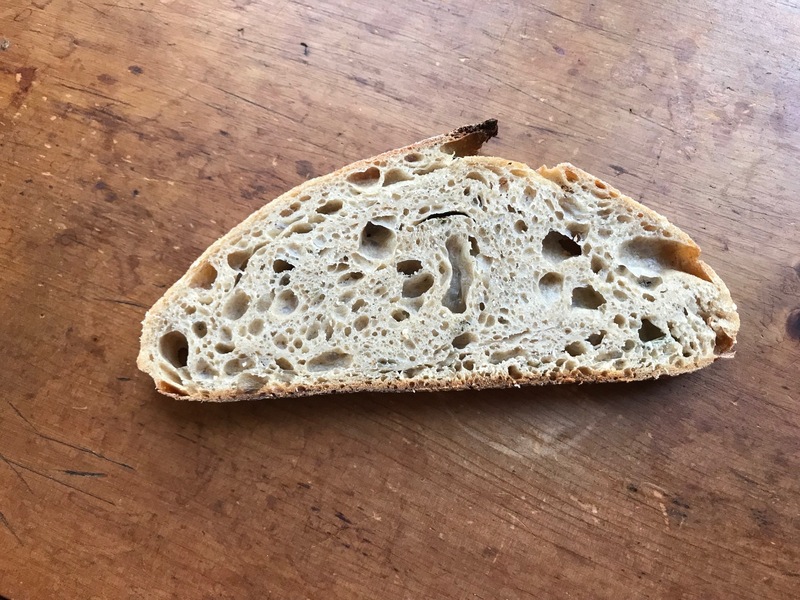 If I had to judge, based on how open your crumb is, I’d say you’re getting an excellent rise, it’s just not predominantly upward rise. The same loaf in a smaller diameter Dutch oven or a larger loaf in the same DO probably would have gone through your roof. I’ve gotta work on my scoring and shaping, though it’s hard to do either with such wet dough. I probably incorporated a bit more water than the recipe calls for, just by wetting my hands when handling the dough. 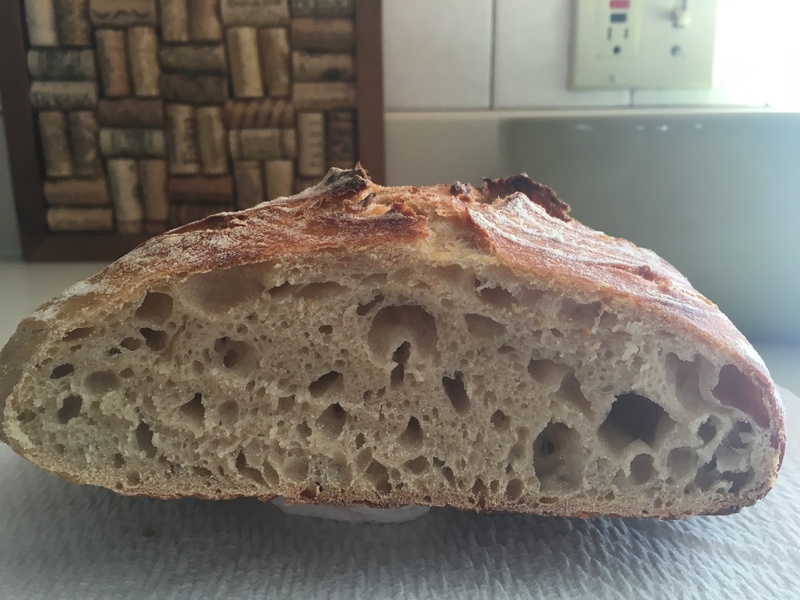 I used half the starter (1/8 cup) and let the dough ferment in the refrigerator for 48 hours, plus another roughly 18 hours at room temperature. Added dried rosemary during the folding stage before shaping. 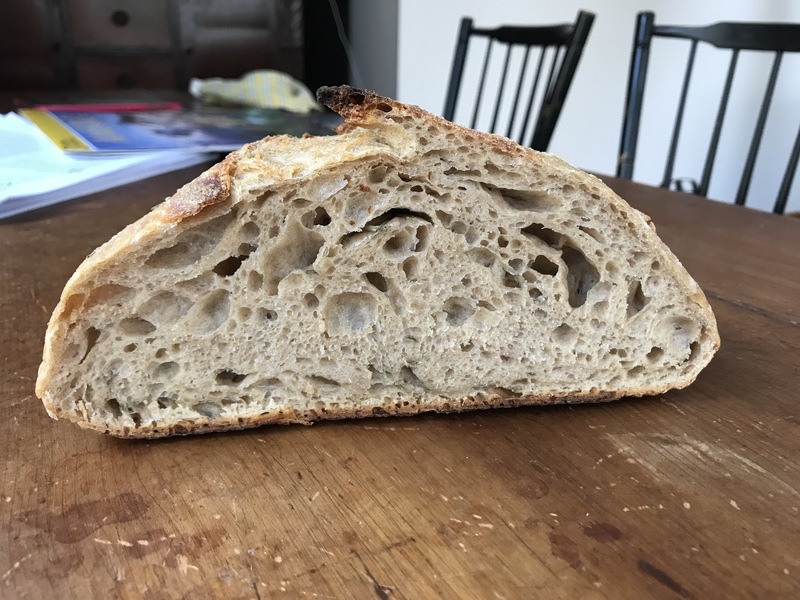 The result is quite sour–almost too sour, and I love sourdough. However, it’s now a day after baking and the flavor has mellowed a bit – fantastic toasted with butter and mixed berry jam. One concern: I still worry I’m underproofing the dough, despite 2 days fermentation in the fridge plus overnight (and then some) on the counter. 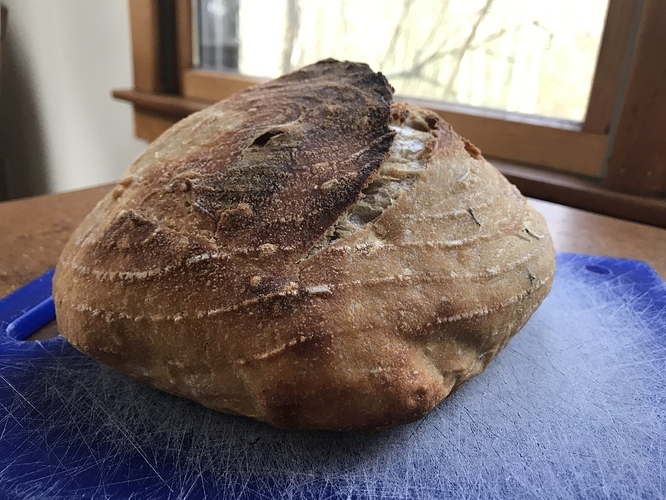 We keep our fridge cold (34 degrees F) and house cool (67 degrees), and at 1 1/2 hours into the final proof the dough didn’t seem ready at all–it was hard to do the poke test given the wetness of the dough. Full proofing was about 2 hours 10 minutes. 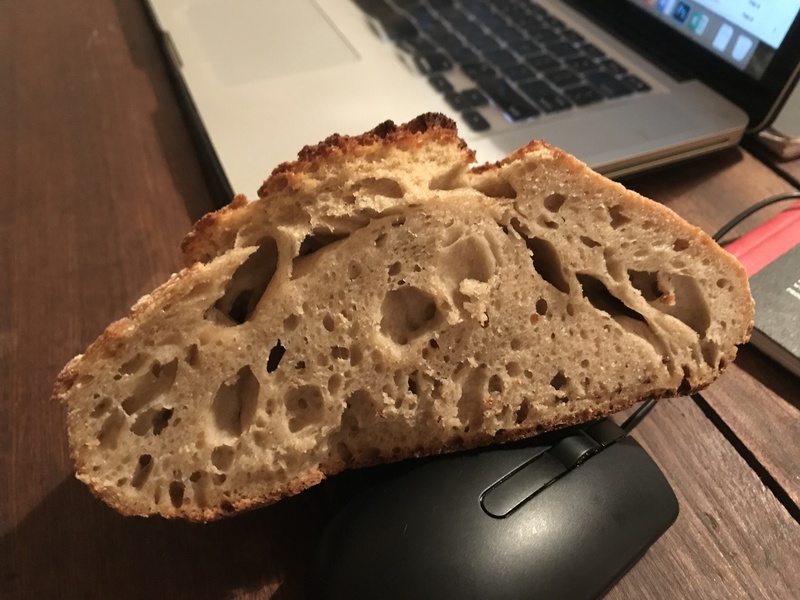 I let the bread cool for an hour and a half, and the interior seemed a bit gummy/too moist, though the crumb is pretty good. Though as I said it’s better today, the day after baking. This didn’t upload with my post, so adding it here. I use an ovenproof dish - thick cast iron with a glass lid. I think it is important to be able to heat the baking implement and and throw the dough in and seal it to mushroom. I think anything you can heat and slightly seal would be better than an open oven. Also any pizza oven would work great. Or a baking pan with holes in the side in a convection oven or gas oven. I love this low-recipe! have used it to make great bread and focaccia. Hoping now to make some hot cross buns, but wondering if anyone has played win this recipe in that way. I’m thinking I would add the extra ingredients before the brief stretch and fold, then proof as buns, but it probably needs some extra flour to make it less wet and more mouldable. There is no reason you can’t make “buns” from the recipe as you suggest. Hot cross buns are usually an enriched, almost brioche dough so you might also look at @Fermentada’s Milk bread/roll recips which is a soft, tender, slightly sweet dough. I make an enriched brioche kind of sourdough and use the same sweet stiff starter: 90 g flour, 25 g active starter (whatever your starter is), 40 g water and 20 g sugar. I usually mix this in the evening. I then use a stand mixer for this dough so not exactly a no knead and if you want to combine by hand go for it. For myself, combining the eggs, sugar and butter is easier with the mixer. After mixing, I let it sit at room temp for 2-4 hours and then into the frig for 24 (ish) hours. Let the dough warm, roll / shape as you want. I make cinnamon rolls, babka like sweet roll, “Danish”, and doughnuts with this dough. If I was using it for hot cross buns, I’d add the spices and raisins after mixing before refrigerating … I think. If you go this way, the dough seems a bit stiff and like it hasn’t risen much out of the refrigerator, but as it warms it softens and gets a bit puffy and I get good rise and nice soft interior. There is a completely no knead brioche dough here. I made this recipe (actually 1/4 or 1/2) before I started making sourdough. I’m fairly sure you would be fine with regular starter (110 grams, 1/2 cup) in place of the yeast if you didn’t want to deal with the sweet starter. I neeeeeed to make this. It looks so good. Yep, that’s the interior of the baklava babka It is such fun to make. I’ve made the cinnamon nut with honey syrup and also an orange-cranberry with orange syrup. 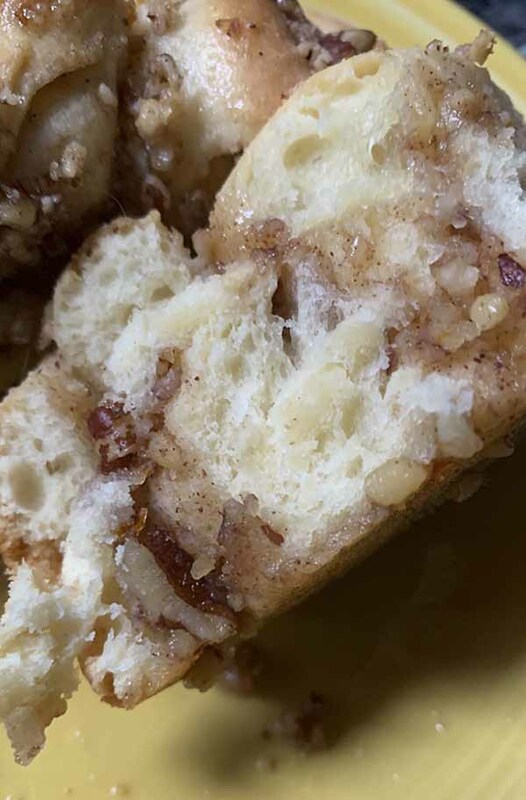 Like your naan babka, I think the filling gets distributed better in the babka roll/cut/twist than in cinnamon rolls, but there is room for all of them !! 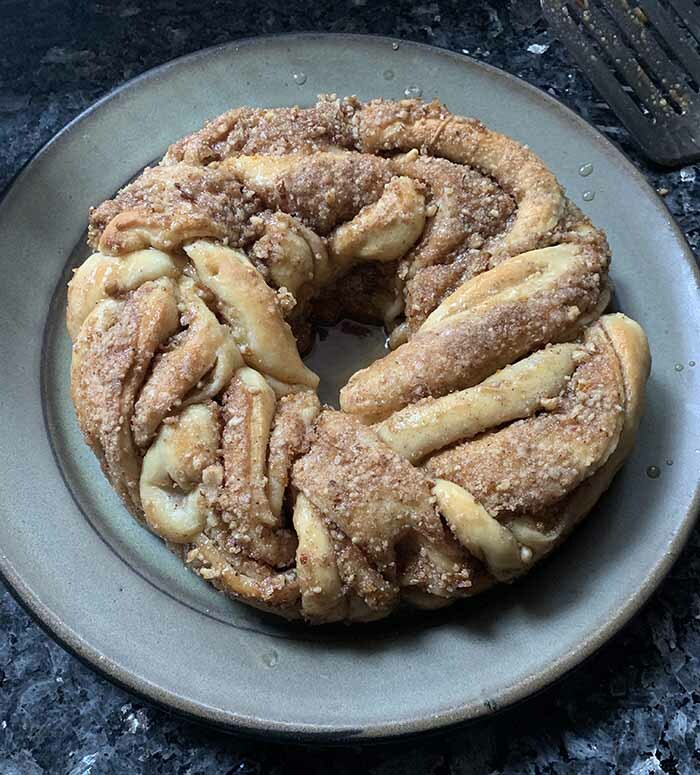 Since Melissa brought it up … the baklava babka was originally Smitten Kitchen’s Baklava Babka. I adapted it for sourdough. That’s gorgeous! Thanks for the sourdough conversion and the smitten kitchen link for the filling part of the recipe. When you made an orange cranberry one, did you use an orange cranberry marmelade for the filling? So many possibilities, strawberry cream cheese is coming to mind too. 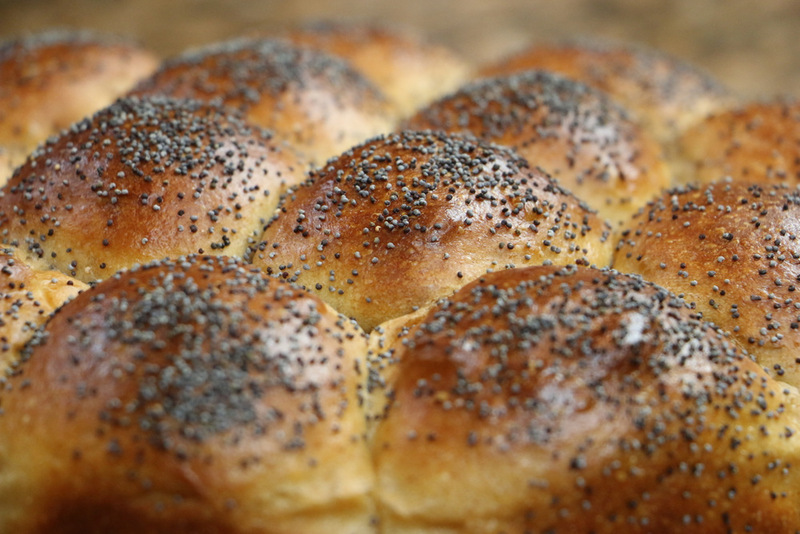 There is also @Eric’s Easy Bake Series numbers 3 & 4 which presents an enriched dough and tutorials for using it to make sandwich bread, dinner rolls, hot dog buns, and hamburger buns. Not entirely no-knead, but not far from it (and my guess is that you could get by without the kneading that @Eric does and still get fine results [maybe increase the hydration a few percent…]). Sometimes a crusty artisan loaf with big holes doesn't quite cut it. For sandwiches, a bread that's light and tender, easy to chew, flavorful but not overpowering, kid friendly yet wholesome is often the way to go. This bread is it. Soft Pull-Apart Dinner Rolls. Hamburger & Hotdog Buns Too! Enriched dough is a wondrous thing. There's so much good that can come from it. Here are a couple of examples with far reaching benefits for humanity. mix the zest into the sugar so the zest releases oil, mixes in and smells wonderful!